Social media led an 11-year-old to take action to save the girl's life. A young boy is being credited with saving his friend’s life from across the country with the help of social media. Soon to be 12-year-old Gabe Rongier from Pennsylvania befriended a young girl living in Texas via Snapchat. The girl had become part of a Snapchat group with Gabe and his friends from school. Lori Rongier, Gabe’s mother, was out running errands when she received a panicked text from her son explaining that a friend of his had sent him distressing messages on Snapchat that made him scared and he was worried for her, she told ABC News. Lori was leery, wondering if this person and messages from across the country were real. She and her husband Fred thought someone may be playing a joke. Both parents advised their son not to call authorities. (Fred Rongier) Gabe is being hailed "Snapchat hero" for following his instincts and taking action. However, Gabe truly felt that he needed to take action, and not knowing exactly who to contact, he called a suicide hotline number. The hotline then connected Gabe with local authorities, and by the time Lori got home, Gabe was already on the phone with the Grand Saline Police Department. Officers were then able to take action. With a little investigation, police were able to track down the girl and get her the help she needed. Lori said she and her husband are so thankful Gabe followed his intuition and heart. “Most parents want their kids to listen to them, we’re grateful he didn’t listen and trusted his instincts,” she told ABC. The Grand Saline Police Department sent Gabe a letter thanking him for what he did for his friend, saying they could not have done their job without his help. 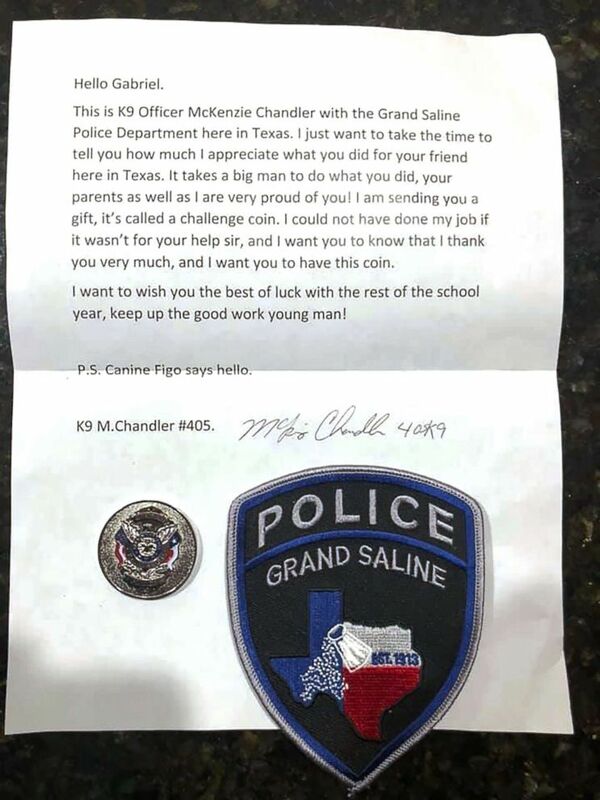 “It takes a big man to do what you did,” Grand Saline K9 Officer Chandler wrote to Gabe. The police department included a police patch and ‘challenge coin’ in their appreciation package to Gabe. (Fred Rongier) The Grand Saline Police Department sent Gabe a letter of appreciation. 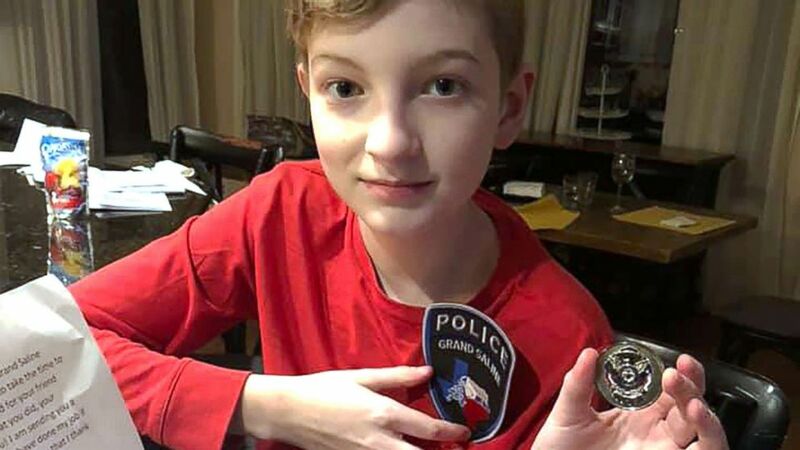 “It’s reassuring to know there are kids out there like Gabe, that go out of their way to help someone else, and through his actions showed bravery and heroism, and we are all very proud of him at the Grand Police Department,” Jeremy Barker, the department's public safety director said in an interview with ABC News. Grand Saline police officers said from their understanding, the young girl is doing well. For anyone who may find themselves in a similar situation as Gabe, Barker encouraged people to “do something,” even if you are not sure exactly who to contact. He said there are resources available and authorities that know how to get in touch with the appropriate people. Gabe’s parents are happy and proud of his courageous actions. “Gabe is showing his character, he is very soft spoken, he has shown everyone he can have a big impact, he has a big heart,” Lori said.